If you're going to buy a new iPhone, this is the one to get – there's a slightly longer battery life, a better camera, fast innards and protection against water. However, many of the changes are slight, and the iPhone 6S, for the lower price, suddenly becomes a very attractive option. Our iPhone 7 review tests and rates the iPhone 7's design and build quality, features, tech specs, speed, camera capabilities and value for money, to help you decide if Apple's new iPhone is the best smartphone for you. The striking new iPhone marks the first time the company has released a handset under the (Product)Red banner. It also arrives 10 years after the Apple’s first (Product)Red offering, the Product(Red) iPod Nano special edition. In that time, Apple says it has donated $130 million USD to Global Fund through its (Red) partnership, making the company the initiative’s most generous corporate donor. So, is the iPhone 7 worth it? While we think the iPhone 7 is a sleek, gorgeous and generally fantastic phone with enhanced cameras, an improved design (with beautiful new colour options), better battery life and a supercharged quad-core A10 Fusion chip, we think it’s a more appealing upgrade for iPhone 6 (and earlier) users. We don't think we could justify the upgrade from an iPhone 6s to an iPhone 7, especially with the price hike in the UK, as the changes aren't as groundbreaking as some we've seen in the past. Is the iPhone 7 better than a Google Pixel, or a Samsung Galaxy S7, or any number of other Android phones? It’s way too subjective for anyone to actually make that call. There’s no denying that Apple’s hardware is some of the best in the business, but the software is going to be very polarizing. If you like iOS, Apple makes a phone that’s more than capable of going toe-to-toe with the best that Samsung, LG, Google, or anyone else can put out. It may not win in every category (excluding the processor), but Apple’s selling point is their ecosystem; your iPhone talks to your iPad, which talks to your MacBook, and all of them share purchases, content, and will all get updated as soon as new software is available. That’s something that no Android OEM really attempts to match. It you’re an iPhone user and intend to stay one, the iPhone 7 will please you by being just a little bit better at everything, without being a revolutionary advance. If you’re an Android user switching over, you’ll likely be pleased with the iPhone 7 once you’ve adjusted your ways to Apple’s approach to smart phone design. So, is Apple giving haters something else to complain about or is there a hidden agenda? A long-term masterplan that most of us are unaware of? And does the average Joe care enough for it to hurt sales? iPhone 7 Review – Is Apple Just Playing Catch-Up with the Competition? Although much of what Apple has done with the new iPhone 7’s are incremental improvements, they will be welcome by the avid Apple user. If you are using an iPhone 6S or 6S Plus you might be able to do without the extra speed and water-resistance. If, however, you are currently using anything older than that, you will at least want to consider the iPhone 7. The iPhone 7 is indeed a powerful phone. It also has a pretty great camera, but I can’t call it an upgrade over the iPhone 6S. If you have one, hold on to it. To me, the iPhone 7 signals a new era for iPhones to come. It is indeed an upgrade over an iPhone 6, but I’d still recommend holding on to that one and buying the iPhone 8 next year. Apple is evidently making changes, from UI to hardware, and there are greater things to come. Speck chose to deliver a new line of iPhone 7 cases that look and feel amazing. The new Presidio iPhone 7 cases use upgraded material to deliver better shock protection while arriving in a thinner design. The Presidio Grip, Inked and Wallet can protect your iPhone 7 from a 10 foot drop while the Presidio Clear, Clear + Glitter and Clear + Print are tested for an 8 foot drop. If it was me, I’ll take the Galaxy S7 edge over the iPhone 7. It has a fresher design, a stunning display and it still has the best camera experience on a smartphone. But if you must get an iOS device, it’s the iPhone 7 hands down. The iPhone 7 is officially priced at RM3,199 for 32GB, RM3,699 for 128GB and RM4,199 for 256GB. Water Proofing the phone has been a welcome addition to the Iphone 7. Even the sound quality has improved as the iPhone 7 now sports stereo speakers. The phone feels sturdy to hold and retains the same solid build feel that iPhones have been known for. It also gets two new colors – Jet Black and Matte Black along with the usual Rose Gold, Silver and Gold. If the Galaxy S7 was expecting an easy fight against the “same old” iPhone 7, it is in for a surprise. Apple managed to pull ahead in staples like battery life, color presentation, outdoor visibility, and audio prowess – in fact, most departments that are near and dear to the average user. The wide color display and camera alone are worth the jump, as these are futureproofing the iPhone 7 for the next two years at least. Boosted by a greatly enhanced iOS 10, the iPhone's software ecosystem has never been richer or more refined, too. 100% There’s no doubt the iPhone 7 is the company’s most controversial handset to date. Removing the headphone jack is sure to upset some users, but this phone is better than the last generation in every way – including its sound. Headphone jack aside, the changes are careful and considered upgrades rather than great leaps forward. But with an improved screen, better sound, faster performance and improved camera, it’s a nicer phone to use than ever. If you have a 6s and are on the fence, don’t do it unless you really want the new camera features. If it doesn’t really matter, hold on to it. If you have a 6 or older and don’t care about the headphone jack, then upgrade because you’ll notice the improvements right away. The iPhone 7 probably won’t convince Android users to switch over, but it will surely please the hordes of people who love their iPhones. The Samsung leads in the style stakes, and gets a leg up in display and longevity. Both devices are evenly matched in terms of cameras, on paper at least, but we'll require a face-off if we're going to make any solid conclusions. The iPhone 7 leads the pack in pure performance, yet we feel the deciding factor will rest with your platform of choice. If you have an iPhone 6, then it makes sense to upgrade to the iPhone 7 as there are significant upgrades between the two. However, if you’re coming from an iPhone 6S, the iPhone 7 might not be a huge deal. And, if you’re a first time iPhone user and you have the money, the iPhone 7 is a pretty heavy investment that could put a huge dent in your wallet. For those who are on a tight budget, the iPhone 6/6s with its reduced retail price (only Php21,800 here) and iOS 10 update is still a much better option. The loss of the headphone jack will undoubtedly take some getting used to, but with the headphone industry increasingly embracing wireless technologies, this may not be as much of an adjustment as you'd expect. The big question is whether you want to fork out £599 or more for the iPhone 7, or hold out for next year's model, thought to be called the iPhone 8, which by all accounts will see a major redesign of Apple's iconic smartphone. So, is the iPhone 7 worth it? While we think the iPhone 7 is a sleek, gorgeous and generally fantastic phone with enhanced cameras, an improved design (with beautiful new colour options), better battery life and a supercharged quad-core A10 Fusion chip, we think it’s a more appealing upgrade for iPhone 6 (and earlier) users. We don’t think we could justify the upgrade from an iPhone 6s to an iPhone 7, especially with the price hike in the UK, as the changes aren’t as ground-breaking as they have been in the past. 80% iPhone 7 review: Return of the king or time to hand over the crown? Having plagued Sony for years, the curse of smartphone stagnation is knocking on Apple's door. Given the rapid rate of progress over the last nine years it was inevitable that eventually the iPhone would become an annual evolution and no longer a revolution. The iPhone 7 is still one of the very best smartphones on sale today and it is of course the best iPhone for those who don't want the gargantuan iPhone 7 Plus. But it perhaps isn't worth buying if you already have the 6S. When you take the iPhone 7 and iPhone 7 Plus as a whole package, you have two of the best Apple has ever created. I don’t think anyone denies this. The problem, if you can even call it that, is that Apple has done this time and time again. The iPhone 6 and iPhone 6 Plus, two years ago, were the best Apple had created. While there are advancements in the hardware, I don’t see anything here that requires anyone with a device that’s two years old to upgrade. If you own an iPhone 6S, water resistance and stereo speakers are nice perks, but little else will separate the daily experience from what you currently own. Ignoring Android options, the iPhone 7 actually finds itself in tough competition from the revised 6S with more storage for a hundred dollars less, and folks who like the iPhone 5 form factor can find a bargain in the iPhone SE. Apple’s iPhone 7 improves on the image quality of its previous devices, with advances in dynamic range, detail preservation, and significantly reduced artifacts, as well as very good stabilization. It performs particularly well in bright light conditions, making it a great smartphone camera for outdoor enthusiasts shooting landscapes, street scenes, architecture, or portraits. Barring its battery life the iPhone 7 is a great phone. Its camera, screen and performance are awesome, and the water resistance is a real boon. There are many positives to take from the iPhone 7, but unfortunately they're negated to a large extent by poor battery life and a lack of basic features. The big question is whether you want to fork out £599 or more for the iPhone 7, or hold out for next year's model, thought to be called the iPhone 8, which by all accounts will see a major redesign of Apple's iconic smartphone. The iPhone 7 it is available to buy now from Apple. All of the UK operators offering a range of deals and tariffs - including EE, O2, Vodafone, Three, Tesco Mobile and Carphone Warehouse. 60% iPhone 7 review: how good can a phone be if the battery doesn't last even a day? The iPhone 7 is a missed opportunity. Apart from a bit of fluff retention the fit and finish, the cameras, fingerprint scanner, snappy performance and waterproofing are all great. But what does it matter how good it is when the battery is dead? The battery life just isn’t good enough to last one day, let alone two when so many other smartphones do. And when the iPhone 7 is dead it takes ages to charge it up again. It’s really poor. Then there’s the headphone jack, which wasn’t really an issue for me having adopted Bluetooth headphones years ago. Apple has never shifted from its strategy when it comes to pricing its new iPhones. The same configurations are still present here, as the iPhone 7 is priced at $649 (32GB), $749 (128GB), or $849 (256GB). Unless you’re the kind of person that doesn’t take a ton of photos, we’d recommend at least going with the 128GB model, seeing that 32GB is just too skimpy for a phone that has no storage expansion. There's no denying the iPhone 7 is a great smartphone, but none of its improvements are quite as impressive as I'd hoped, which makes it feel more like an iterative S update than the next big evolutionary leap. It's certainly raised the bar for iPhones a little higher, but in many ways it's still catching up to its Android competitors, as both the camera and the display aren't quite as good as the very best. The iPhone 7 is available now in rose gold, gold, silver, black (matte), and jet black (glossy). 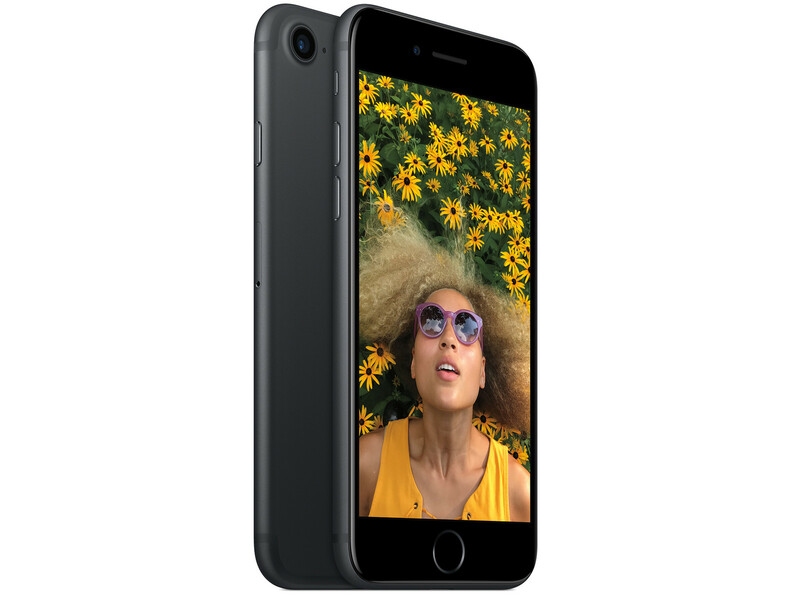 Jet black is only available in the 128 GB or 256 GB capacities. Full retail price starts at US$649. Better cameras, faster performance, and water-resistance are probably enough to convince many that it’s time for an upgrade. They have, after all, the potential to legitimately impact your day to day experience of living with an iPhone. The decision is a whole lot easier if you’re using an older iPhone, too: the iPhone 7 will be a significant improvement. Well, it will probably be some time before we see how users respond, especially as more and more Lightning-supporting headphones come to market, but that's not even the most important point here. What we have is evidence of an Apple that's not afraid to take risks, to keep pushing its users towards its vision of the perfect personal communication/entertainment/fitness – heck, just the perfect device for everything. And while nobody – not even Apple – is there quite yet, handsets like the iPhone 7 remind us that there's always room for smartphones to grow, to improve, and to expand our perceptions of what a phone can do for us. If you’re going to buy an iPhone 7, go with the Plus. It’s better. And make sure it’s 128GB+, not jet black (it scratches easy and is a fingerprint magnet), and a Sprint or Verizon model while you’re at it. If you buy Sprint or Verizon, your phone will work on any carrier. If you buy an AT&T/T-Mobile model, it will not work on Sprint or Verizon. This is good if you intend to sell it down the road, but also good in case you decide to switch carriers. The things that are great about the iPhone 7—primarily its speed and the camera—are likely to be even better in the next generation. On the other hand, the things that aggravate me about this iPhone—namely, the weird Home button and the aggravation of switching to wireless headphones—are likely to be improved. If you’re excited enough about the camera to upgrade, or your current iPhone is old enough that you want to upgrade, this is the best iPhone for you. But if the drawbacks make you want to sit out a year, I think that’s really smart. The iPhone 7 does, however, take its place as the best iPhone yet, and for many fans that will be enough. It has a better camera than the iPhone 6s, more colour options, and that luscious Jet Black finish for those who like a bit of smartphone bling. It’s faster and water-resistant, the screen is improved and the new haptic home button is a dream to use. The jury’s still out on battery life, but it's looking good right now, and with the long-standing storage issue remedied by the introduction of a 32GB base model, I’m happy recommending the iPhone 7. It’s an outstanding smartphone. If you have the iPhone 6s already, there’s nothing really groundbreaking here to make you upgrade. However if you’re still rocking the 6 or below, it’s worth making the jump to get the latest features. The latest devices from smartphone rivals Apple and Samsung have gone head-to-head in a brutal new power test. Apple launched the iPhone 7 and iPhone 7 Plus earlier this month, and promptly sold-out of the must-have new smartphone. iPhone 7 is powered by Apple's own A10 Fusion chip – the Cupertino company's fastest silicon yet. No radical redesign, no resolution boost and no headphone port. If you look at what the iPhone 7 is missing, at least on paper, it's all too easy to dismiss Apple's latest pocket blower as just yet another iterative update. There's more to it than that though. A lot more. This is a phone that's added more updates than you can count on your hands and importantly, all of these additions combine to make a major difference. If you already own last year’s iPhone 6s or 6s Plus, there’s little reason to step up to the seven. Sure there’s a fair few improvements, such as the water resistant design and new better-in-low-light camera, but nothing that’ll blow your mind. Once you get down to the iPhone 6, there’s more reason to update here - mostly that super-nippy performance from Apple’s A10 Fusion processor. And if you’re jumping into the wonderful world of Apple mobiles for the first time, then this is undoubtedly the handset to spring for. A lack of expandable storage aside, it’s one of the best blowers of 2016, standing toe-to-toe with the likes of Samsung’s Galaxy S7. Yes, the iPhone 7 comes without an audio jack and pretty much without a Home button - one that you can press the old fashioned way anyhow. It uses the same design and same screen size and resolution. And, yes, it's better than the iPhone 6s in so many ways. If you are still not impressed, though, the iPhone 7 Plus could be your thing, with a bigger screen and a brand new dual-camera setup, involving a regular and telephoto lens. Or, you may want to wait for the anniversary iPhone next year and keep a very capable iPhone 6s around for another year - if you don't insist on water protection and stereo speakers. I’ve been getting slightly bored of Apple’s smartphone lineup in recent months. But the improvements the company made with the iPhone 7, combined with the excellent iOS 10 update, helped me appreciate the iPhone all over again. 85% Apple iPhone 7 and 7 Plus review: Big upgrades, but where's the next big thing? The iPhone 7 is what we expected - it's clearly one of the best phones around and matches the rival Galaxy S7 almost punch for punch. It's priced at a premium level - though Apple will sell bucketloads of course. So do we like it? In a word, 'yes', but we feel there's a lot more going for the iPhone 7 Plus, especially when you consider the dual camera. (We've been quite spoilt with larger phones recently, too.) In a sense the iPhone 7's biggest rival isn't the S7, it's the iPhone 6S and iPhone SE. They're are still sticking around and are - of course - pretty formidable devices in themselves. Both give you so much and they will appeal to those sticklers who simply can't cope without the headphone jack. I’ve only played around with the iPhone 7’s new iSight camera a little bit since unboxing the device this morning, and so far I’m impressed with it. Like previous iPhones, it takes terrific pictures and super sharp 4K video. It’s also wonderfully fast. Is it better than the iPhone 6s’ camera? It’s hard to tell at this point. I haven’t noticed much of a difference so far, but I think the main improvement will be in low-light environments, so I’m looking forward to taking some shots when the sun goes down this evening. The iPhone 7 is not the overhaul that Apple usually presents us with every two years, but there is enough here to keep those upgrading from the iPhone 6 happy. At first glance, however, it's perhaps not the phone to draw in iPhone 6S fans who might be upset that their phone is now old and needs to be replaced - for the iPhone 7 could almost be seen as an "S" version of the iPhone 6S. The removal of the 3.5mm headphone jack may remain briefly controversial, while the odd-looking AirPods (£159) have also raised some eyebrows. But this biggest point of change isn't really going to impact most users as much as it might sound. Overall, it's not a massive upgrade from the last model, the iPhone 6S. The water resistance is a great addition, but not necessarily a feature that warrants an upgrade. If you have an iPhone 5 or 5S, this would definitely be a massive step up, but if you have the iPhone 6 or iPhone 6S, consider your budget before upgrading. While the iPhone 7 is available in different storage options, the Samsung Galaxy S7 has a base 32GB of storage and extra storage can be added using a Micro SD card. This means that a 200GB of storage can be easily added to the phone. The iPhone 7 finally sees the end of the 16GB base model, which left very little room for storing anything. It is fast, incredibly powerful, has a much-improved camera and is now water resistant. The new Jet Black colour scheme is also irresistible and we guarantee the first time you see it you’ll want to pop it straight in your pocket. This is all positive news for iPhone fans desperate for the latest and greatest smartphone from Apple, but we can’t help feeling this device could have been made even better. Apple's new flagship phone is faster than its predecessor, it has a better camera and screen, more storage, and it's water-resistant. If you can deal with the lack of headphone jack, it's worth the upgrade from an older iPhone. But while it's a great phone, it's not the very best. The most compelling improvement on the iPhone 7 and 7 Plus is the sharp speed increase,” wrote the New York Times’s Brian X. Chen. “Spurred by faster chips, everything—switching between apps, opening the camera—feels snappier. This phone really shouldn’t feel like a major update. Standout features here, such as waterproofing, are long overdue in Apple land, the design has barely changed bar a few skin-deep tweaks, and some of the upgrades fans have been crying out for (more storage, for instance) come at the expense of mid-range models. We’ve been stung by a Brexit-related price spike here in the UK, too. Buying into the iPhone way of life was never cheap, but you’ll be forking over £800 for the top-spec 256GB model. Which is the best flagship smartphone? The iPhone 7's notable camera, battery and water resistance improvements are a worthwhile upgrades to a familiar phone design, but ask yourself if you really need an upgrade...and if the Plus might be a better choice. Whether or not the iPhone 7 is for you will depend on your expectations and which current iOS device you’re using. If you’re still rocking a 6 or 5, the 40 percent increase in hardware power over the 6s with with the iPhone 7, could be reason alone to warrant an upgrade. Subtle new features like the home button’s new Taptic Engine and Stereo speakers, breathe new life into the aging overall design. Overall, though, Arnold was pleasantly surprised by the results. “I’m quite happy with the quality of the images for use on the web and relieved that the fully automatic operation of the iPhone can result in such stunning pictures with very little technical knowhow,” he says. But for his exhibition prints, he’ll continue to rely on his DSLR for now. In all, this is a solid, handsome upgrade to a phone which was already at or near the top of the smartphone pile. Now, Apple strides ahead again. The iPhone 7 remains a highly powerful processing machine, featuring a solid 12-megapixel camera, and with the enlarged battery and increased optimization, the water-resistant device can turn some heads. Whether you prefer the iPhone 7 or the Galaxy S7 comes down to personal preference, but both are fairly evenly matched when it comes to specifications. The Galaxy S7 has a bigger, higher-resolution screen, bigger battery and a microSD slot, while the iPhone 7 has the fastest available processor in any smartphone and a 12MP camera described as the best on the market. Everything is this list seems to be an improvement, except possibly the dropping of the headphone socket. But Apple has cleverly largely negated the complaints by packing in the box the Lightning to Headphone adaptor (you can buy these from the Apple store for $12). And if you want to get the jump on Lightning earphones, the Lightning Earpods are also available separately for $45. Expect to see some interesting innovations in this space. As such, and as ever, the real verdict will come with long-term experience. And it's hard, especially for anyone who uses their iPhone for music, not to see the change in headphone connection, and the launch of new Apple headphones, as key to how popular the latest iPhone ultimately proves. If you are tired of iPhone, the iPhone 7 is not going to change your mind, especially if you have a lovely pair of wired headphones and are not keen on using an adapter with its Lightning port. In the same breath, the Samsung Galaxy S7 retains some of the software niggles found on any Android device and the Google Play Store cannot compare to the iOS App Store. However, it definitely offers some clear hardware advantages - most notably with its beautiful screen and cheaper cost. Lohnt der Umstieg vom iPhone 6s Plus? Positive: High autonomy; good cameras; waterproof; high performance. Negative: No headphone jack. Positive: Support waterproof; excellent cameras; high performance; long battery life. Negative: No headphone jack. Positive: High autonomy; powerful hardware; high gaming performance; waterproof and dust avoiding; excellent cameras. Negative: No headphone jack; uncomfortable home button. Positive: Support waterproof IP67; excellent display; high performance; high quality speakers; very good cameras; high autonomy. Negative: No headphone jack; high price. Positive: Excellent display; high performance; support waterproof; good sound. Negative: No headphone jack; relatively high price. Positive: Long battery life; waterproof; quality cameras; good performance. Negative: No 3.5mm audio jack. Positive: New home button; long battery life; excellent cameras. Negative: No 3.5mm audio jack. 84% Apple Iphone 7 & Iphone 7 Plus – Saaie Update? Positive: Long battery life; excellent cameras; waterproof. Negative: No headphone jack 3.5mm. Positive: Waterproof and dust avoiding; long battery life; new jet black color; new home button technology; good sound and cameras. Negative: No headphone jack 3.5mm. Negative: No headphone jack; uncomfortable new home button. Positive: New impressive jet black color. Negative: No audio jack. 89% Apple iPhone 7 incelemesi Apple iPhone 7 testte! Positive: Waterproof and dust avoiding; excellent cameras; good display; impressive jet black color. Negative: Ordinary design; no headphone jack. Positive: Waterproof; good cameras; fast charging; quality sound. Negative: Very large screen; unsupport dual sim. Positive: Impressive performance; excellent cameras; long battery life. Positive: Impressive black color; excellent performance; great cameras; waterproof; long battery life. Negative: No 3.5mm audio jack. Positive: Good display; waterproof; powerful dual speakers. Negative: Imperfect design; no 3.5mm audio jack; mediocre cameras. Positive: High performance; excellent display; quality cameras; support waterproof and dust avoiding. Negative: No extended memory card slot; average autonomy. Positive: Powerful hardware; high performance; long battery life; good display; excellent cameras. Negative: No headphone jack; high price. 80% Recenze: Apple iPhone 7: je vůbec potřeba? Positive: Excellent speakers; support waterproof; flexible fingerprint sensor; good display; decent cameras. Negative: High price; same design; no headphone jack; unsupport wireless charging. Recenze Apple iPhone 7: umíráček pro legendu? Positive: Good capacity; support waterproof; decent speakers. Negative: Uncomfortable new home button. Positive: New waterproof technology IP67; quality cameras; good performance; long battery life. Negative: Unsupport headphone jack 3.5mm. 83% iPhone 7 og iPhone 7 Plus test – skal du købe? 96% Tento Apple iPhone 7 chcem, len nie v tejto farbe! Positive: Excellent speakers; good cameras; support waterproof. Negative: New jet black color; short battery life; high price. Positive: High performance; support waterproof IP67; excellent cameras. Negative: No headphone jack. Positive: Nice design; support waterproof and dust avoiding; decent speakers. Negative: No headphone jack; high price. Model: The iPhone has been the smartphone to beat since the day it was launched. Apple has been breaking some kind of records from the first iPhone till the iPhone 6s which was launched in 2015. The same goes with this year's iPhone 7. For a start, it comes with the same screen as the iPhone 6s, a 4.7" IPS LCD with a resolution of 750 x 1334 pixels. It is still one of the most stunning display out there but loses badly to even the mid range Android Phones in terms of resolution. In terms of outlook, the iPhone 7 looks exactly like its predecessors, the iPhone 6 and iPhone 6s. It has the same dimensions too at 138.3 x 67.1 x 7.1 mm and weighs at 138 g, about 5 grams lighter than the 6s. The only notable physical differences between the iPhone 6s and 7 are the antenna lines on the back. They have been repositioned to the top and coloured to blend into the body. The camera bump is also slightly thicker and bigger on the iPhone 7. Nevertheless, if the iPhone 7 is used with a case, it'll look exactly like the iPhone 6s. Its aluminium body is as steady and classy as before and is now water and dust resistant with an IP67 rating. Inside the iPhone 7 is Apple's latest A10 Fusion processor which is said to be as powerful as a laptop processor. It is coupled with a 6 core GPU, 2 GB of RAM and 32 GB, 128 GB or 256 GB of storage. Another big improvement is its camera. It features the same 12MP 1/2.7”-type sensor but the iPhone 7 has brighter lens – f/1.8 compared to the f/2.2 in the 6s. It also features optical stabilization, which was only available on the bigger iPhone 6S Plus previously. Image quality is further enhanced by an improved image processing. The missing 3.5 mm headphones jack has made way for other component enhancements. This includes a larger battery and better speakers. The battery is said to provide 1 hour of additional battery life compared to the iPhone 6s. The speakers produce better audio quality with louder and clearer tones. The bass in also better on the iPhone 7. Besides these, the removal of the headphone jack had made it possible to use a Macbook trackpad like a pressure sensitive touch button. The button isn't actually a physical button but pressing on the button will trigger the taptic engine to give a up down movement feel. This enables more pressing and feedback options which may be explored in the future by Apple's newer OS or by third party apps. Potential buyers who are put back by the lack of a headphones jack should know that all iPhone 7s' are supplied with a Lightning-to-3.5mm adapter and Lightning EarPods in the box. Besides, there are many choices of wireless earphones out there including Apple's very own Wireless AirPods. The iPhone 7 comes in 2 new colors, Black and Jet Black. Black is a replacement for Space Grey that came before. It is the preferred color as it covers up all the borders and joints on the iPhone, giving it a full unibody look. The Jet Black color has a high gloss finish, which is also nice but it attracts smudges and, worse, scratches. Apple has stated that its surface is equally as hard as other anodized Apple products; however, its high shine may show fine micro-abrasions with use. The iPhone 7 is a good choice to many but for the iPhone 6s users, it may not give many additional features and it even looks and feels the same. 85.18%: This is a good rating above average. Nevertheless you should not forget, that 10-15% of all notebook-models get a better rating.